This is the latest and finest collaboration between Curve and Rose Theatre Kingston. 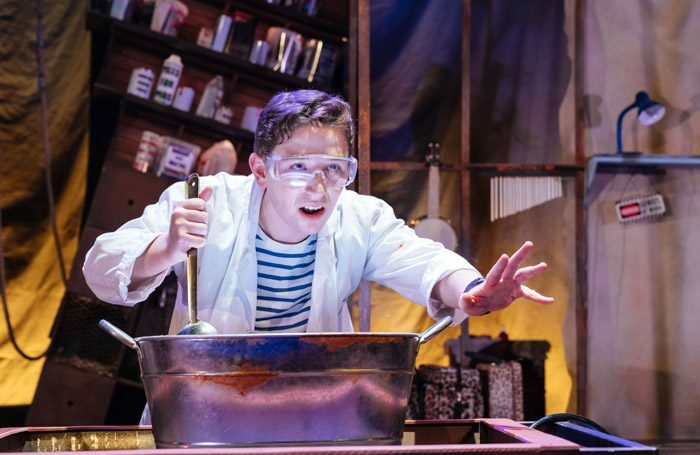 Children’s theatre doesn’t come much better than Roald Dahl adapted by David Wood, and his version of George’s Marvellous Medicine is so glorious that you really don’t want it to end. It’s utter madness, staged on a set that includes a crazily angled chicken shed and a wallpapered Portaloo. Julia Thomas’ production is peopled with mad scientists in white coats and invaded by a giant chicken (memorably performed by Chandni Mistry). Justin Wilman, as Dad, picks up umpteen instruments at will and plays them all fluently, and Catherine Morris gives a beautifully clear performance as Mum. The young audience manages to remember all the ingredients of George’s potion and which source they came from, and they help to warm it and stir it. Grandma’s swelling-up is a theatrical tour de force and her downfall is exquisite.